Hogwash Bend Conservation Park is a protected area located in the Australian state of South Australia in the Riverland in the localities of Cadell and Taylorville in the state's east about 148 kilometres (92 mi) north-east of the state capital of Adelaide and about 8 kilometres (5.0 mi) east of the town of Cadell. The conservation park consists of three following parcels of land located in two separate localities – Sections 275 & 412 and Allotment 1 of Deposited Plan 84790 in the cadastral unit of the Hundred of Cadell which are in Cadell on the south side of the Murray River and Section 88 in the Hundred of Stuart which is in Taylorville on the north side of the river. 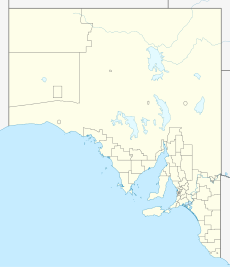 The land was purchased by the Australian and South Australian governments for the purpose of providing habitat for breeding pairs of the eastern subspecies of the Regent Parrot which is listed as a vulnerable species under the Australian Environment Protection and Biodiversity Conservation Act 1999. The conservation park was named after Hogwash Bend, a bend on the southern side of the river that it occupies. It was proclaimed under the National Parks and Wildlife Act 1972 on 6 September 2012. As of 2016, it covered an area of 4.02 square kilometres (1.55 sq mi). … The recently acquired Hogwash Bend site supports mature river red gums, nesting sites for regent parrots, and a large area of mallee woodland in close proximity, providing the essential feeding requirements for the breeding parrots. Eastern regent parrots require feeding grounds to be located within 20 kilometres of their nesting colonies… In addition to the eastern regent parrot, I can inform members that the property protects habitat supporting other threatened species, including the brush-tailed possum, darter, little friarbird, Gilbert's Whistler, Australian bustard and the carpet python. ^ a b c "Search results for 'Hogwash Bend Conservation Park' with the following datasets selected – 'Suburbs and Localities', 'Government Towns', 'NPW and Conservation Boundaries', 'NPW and Conservation Properties', 'Roads' and 'Gazetteer'". Location SA Map Viewer. South Australian Government. Retrieved 12 April 2018. ^ a b "National Parks and Wildlife (Hogwash Bend Conservation Park) Proclamation 2012". South Australian Government Gazette. South Australian Government. 6 September 2012. p. 4359. Retrieved 12 April 2018. ^ "National Recovery Plan for the Regent Parrot (eastern subspecies) Polytelis anthopeplus monarchoides". Australian Government, Department of Environment and Energy. 2011. Retrieved 12 April 2018. ^ Caica, Paul (23 February 2011). "HOUSE OF ASSEMBLY, Wednesday 23 February 2011, VULNERABLE SPECIES, MURRAY-DARLING BASIN". South Australian Parliament. South Australian Government. pp. 2602–2603. Retrieved 12 April 2018. This page was last edited on 11 January 2019, at 19:57 (UTC).